“Mission: Impossible – Ghost Protocol” is set to become the best reviewed and biggest revenue generator of all the Tom Cruise “Mission: Impossible”s so far. 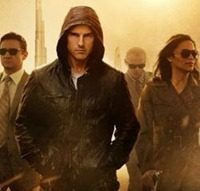 Released on December 16, “Mission: Impossible – Ghost Protocol” has already earned more in US box offices, $141.2 million, than “Mission Impossible III” did during its entire US box office run, $134 million. This latest flick in the “Mission: Impossible” series is also garnering the most positive reviews of the series. The original “Mission: Impossible” film received a 60% rating at Rotten Tomatoes. “Mission: Impossible II” received a rating of 57%, “Mission: Impossible III” did a bit better at 70%. And with 175 reviews so far, “Mission: Impossible – Ghost Protocol” has gotten a 93% rating. The weekend after Christmas is typically a big weekend for moviegoers. The Christmas rush is over, but many of us still have a bit more vacation time before it’s back to work. “Mission: Impossible – Ghost Protocol”, with $31.3 million earned over the three day weekend, came in number one at the box office for the weekend. Coming in second place was “Sherlock Holmes: A Game of Shadows,” which brought in $22.1 million. In third place was “Alvin and the Chipmunks: Chipwrecked,” which brought in $18.3 million. The Chipmunks were followed by Steven Spielberg’s “War Horse”, which premiered this weekend and earned $16.9 million. “The Girl with the Dragon Tattoo (2011)”, came in fifth place with box office receipts of $19 million.